So a few days ago I posted that the diastole of my blood pressure was slightly high, 110/90 so I am going to up my health game in terms of exercise and diet. So far, I’ve jogged twice. Not too long so far, a mile one day and a quarter mile another day. Not much but it’s a start. And I ate an avocado. Ok ok fair point, good reader, I’m not the first person to eat an avocado. HOWEVER, it was the first time I ever bought/cut open/prepared this great superfood. 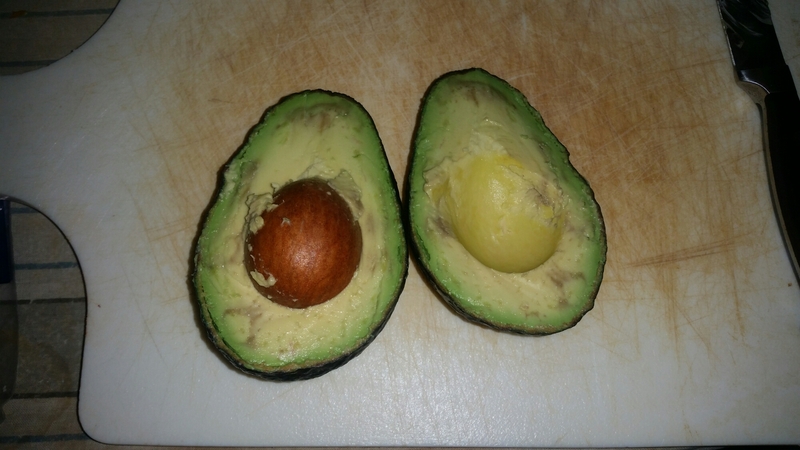 You were an avocado virgin… Really?! A favorite. Just a note. Those brown spots mean it is a bit beyond its prime, kind of like a banana that begins to brown. Still edible, good for mashing, just not the best. I buy them as hard as a rock, let them sit on the counter for a few days. As soon as you can lightly press into the skin, cut it up. Works well for slicing or cubing, for a sandwich, etc.